With over 50 shops and restaurants to choose from, the Scotch Hall Shopping Centre Gift Card is the perfect gift for every occasion. The Gift Card can be used in our stores and eateries. You can purchase the Scotch Hall Gift Card* from the Scotch Hall Information Desk and then simply decide on the amount you wish to load – up to €500. Unlike conventional gift vouchers, there is no need to spend the full amount all at once, as the remaining balance can be spent during subsequent visits. You can check your voucher’s balance at the Customer Service Desk, level 1, center mall or contact us at 041 984 3319 and please have your 16 digit number on the back of your card at hand. * The Scotch Hall Gift Card can be purchased using cash and all major credit cards; full terms and conditions available from the Scotch Hall Information Desk on Level 1. 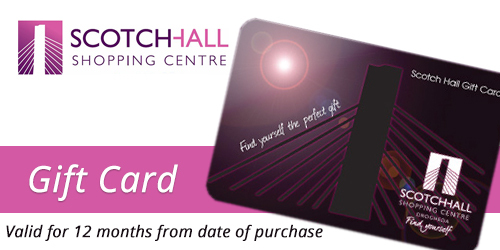 The Scotch Hall Gift Card is valid for 12 months from date of purchase and can be used in all the shops at Scotch Hall Shopping Centre. This card is issued by EML Payments – www.emlpayments.com. EML is MasterCard® PCI Compliant and Visa® Compliant service provider, undergoing annual reviews to maintain these regulatory certifications. EML works to comply with the regulatory requirements and guidance of these agencies and laws: OCC, OSFI, FinCEN, OFAC, FDIC, FinTrac and HIPPA. Should you need to contact them please access this link.